The map here is the Tithe Map that was drawn up between 1838 and 1840. The Tithe Apportionment that accompanies it shows the owners and occupants of the properties. The section shown here was known as Rotten Row and today it is called Chapel Street. As far as possible we have tried to link the Tithe plot numbers to the houses that were in this street at the time of the 1840 survey and up until the redevelopments of the 1960s which saw the demolition of the properties on plots 110 to 117 to make modern flats. Other changes include the conversion of the Wesleyan Chapel into the Cossham Hall after it was handed over to Thornbury by Handel Cossham in 1888. In 1972 the adjoining Armstrong Hall was opened and the building of this complex involved the demolition of another property on plot 107 next to what is now 4 Chapel Street and the home of Thornbury and District Museum. Plot number 105 – is shown as a house and stable owned by a charitable trust then called the ‘Feoffees of Thornbury.’ This was said to be a house and stable occupied by Walwin Baylis. This property has given us some difficulty as number 105 is clearly shown as being immediately behind the New Inn. 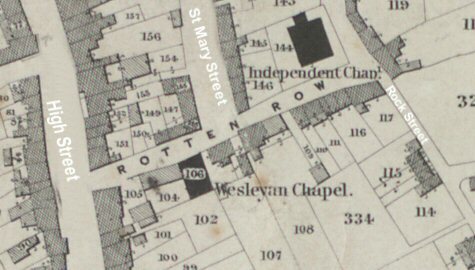 However Walwin is later to be found living at what became 4 Chapel Street on part of plot 107 which was known to have been owned by the Feoffees. We do not know if the Tithe Apportionment is wrong or if the ownership of a property behind the New Inn was exchanged for that of another property next to the Wheatsheaf and the tenant also transferred. Plot Number 108 – is shown as a house and garden owned and occupied by John Williams. This was a beerhouse that became The Wheatsheaf. Plot Number 116 – is shown as four separate properties owned by Robert Ann These were three other houses with gardens occupied by John Beale, Matthew Mills and William Lippiatt which we believe later became numbers 10a 12 and 14 Chapel Street and a house blacksmith’s shop and garden occupied by John Wilson which we believe were actually part of plot 115 and which were in what later became Upper Bath Road.